Family Crest Catering, Inc. has established a reputation for preparing only the finest in food and service for any occasion. From menu items to staff and rental equipment, Family Crest can arrange your entire event from start to finish. If when reviewing this information there is anything that you desire, or that we may have overlooked, please don't hesitate to ask we'll be happy to accommodate. Our Event Coordinators will surpass your expectations, while paying close attention to details and your budget. 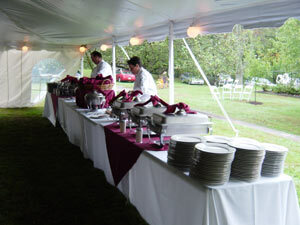 Be it elegant or casual, look no further than Family Crest Catering, Inc. The Following is a partial list of clients the Family Crest Catering has had the pleasure of doing business with throughout the years. Our commitment to quality, presentation, and attentive service is why we attract so many valuable customers and retain their business over time. City Lights Electrical Company, Inc.